Google has chosen Kansas City, Kansas for its new fiber optics project which will provide the city with gigabit connections speeds at retail prices. The modern era of broadband internet lead to the rise of downloadable music, massively multiplayer online gaming, a surge in e-commerce and much more. Now, Google wants to see what a network with 100 times our current levels of speed will create, and they’re using Kansas City, Kansas as their testing grounds. The search engine giant recently announced that they had chosen the city as the host for its Google Fiber project, which will bring gigabit connections speeds to members of the city’s community at prices comparable to traditional highspeed internet. 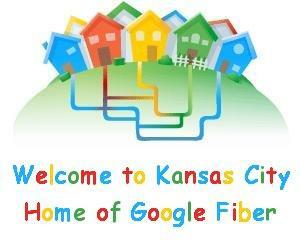 Kansas City was only one of the over 1100 towns that applied for the Google Fiber program – no surprise considering what’s at stake. Not only will residents experience connections speeds that are hard to find outside of academia, they will be ground zero for the next generation of highspeed internet applications Google and its local affiliates hope to develop using the new network. In a way, KC has become the city of tomorrow. Check out Google’s official announcement in the video below, featuring Sergey Brin (founder), Patrick Pichette (CFO), Joe Reardon (Kansas City Mayor) and others. Starting in the first quarter of 2012, Google will help the citizens of Kansas City explore a world of communication where few have gone before. I can’t wait until the rest of us are able to join them. It’s not the speed that could change the world, it’s the availability of that speed. Gigabit fiber optic networks have been in use for more than a decade and now form the backbones of our communication systems in many places (especially at Universities). Newer 10 Gigabit networks are taking their place. As such, Google Fiber isn’t a new technology, it’s a new level of access. Instead of having a gigabit backbone with megabit nerve endings, your standard retail services in your home and office will have the full gigabit connection speeds. That means that your average user would see roughly a 100 increase in their internet broadband connections, or 1000 times better than dial-up. Kansas City gets to be the first municipality where everyone can communicate at these incredible levels. Brin, Pinchette, and the rest of the Google and Kansas City teams do a good job of pumping you up for the idea of gigabit internet as a standard retail service…but what’s actually going to change? At a few megabits of connectivity you can send reasonable quality audio and video via applications like Skype. With gigabits you could send beautifully high definition A/V that will make objects in other rooms appear with crystal clarity (given the right display, of course). In other words, next generation telepresence. Considering that the Kansas University Medical Center is one of the groups in Kansas City coordinating with Google, I think we can expect telemedicine to be one of the first applications we see. But that’s just the tip of the iceberg. Gigabit networks can handle a high level of peer to peer sharing – whether for business or recreation. Or think of digital maps. With this level of gigabit access you could set up cameras at every intersection and let people see high definition footage of wherever they wanted to go. The map becomes the destination to some degree. There are so many possible applications for city-wide gigabit networks that I doubt Google’s engineers have even considered a tenth of them. This is project really is an exploration, and Google/Kansas City will be discovering the new uses for their giganet as much as designing them. After all, how many of us expected Google, Amazon, or Facebook, or iTunes to explode as they have in the past decade with the rise of widespread broadband internet connections? Those that did predict their rise got very rich. Which, I think, is one of the big reasons behind Google Fiber. Kansas City gets a network that will be the envy of the world. Google gets a sneak peak at the trends that will likely dominate the communication and tech industries for the next decade. Win-win doesn’t even begin to cover this scenario. It’s important to note that things are going to take a little bit of time to get ready. The city’s Board of Commissioners still has to approve the project, though that’s probably just going to be a formality at this point. Google is hoping to start preparing the fiber optic network this year, with Q1 2012 serving as the launch for its service. Considering that Google was looking to select its winner by the end of 2010, we should take these projections with a heavy grain of salt. Still, Google chose Kansas City in large part because the city was willing to make an organized effort to attract and enable the fiber project. With both sides working to bring this network online as soon as possible, we may actually see Google Fiber get going in less than a year. Of course, Google isn’t the only group peering through the gigabit lens. Researchers at universities have been developing 100 gigabit (or more) connections between institutions for a variety of applications (medicine, data sharing for astronomy, etc). It only takes 10 gigabits to handle human level vision, so we’re talking about some really incredible communication possibilities here. The next paradigm of the internet is going to come from more than one place. At the moment, however, everyone wants to be Kansas City. I’ll leave you with a brief video that hints at the extent of that desire. Back in 2010, when cities were competing for Google Fiber, Sarasota Florida was one of several places that actually renamed themselves ‘Google’ to attract the company’s attention. The following clip puts that phenomenon to song. We’ll give you our identity, our dignity, our cooperation…just give us faster internet. Google, what have you wrought?